Much of my love for tea has been overshadowed greatly by my love for coffee. Granted, my love for tea developed out of my love for coffee and I definitely drink a lot more coffee than tea, but palate still holds great love for tea. 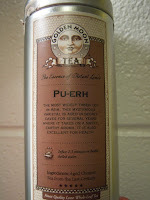 Yet "tea review" opportunities are few (and tea reviewers seem in great numbers), so I jumped at a recent chance to try out some of Golden Moon Tea's Pu-erh. Pu-erh is an odd kind of tea. It's history is much like most teas in that Pu-erh is the name of a town in the Yunnan province, the only province that makes true Pu-erh. Pu-erh is a tea that not only has geographic limits but it also varies in that it is an aged and fermented tea, though the difference in age and quality can drive prices into the tens of thousands. So going simply off the price tag, the tea from Golden Moon clearly was not the highest level but I went into the various muggings with high expectations. The tea arrived in a free leaf form (Pu-erh is also found in compressed cake form), sealed in an air tight tin. As I mentioned, I mugged the tea multiple times and also made sure to do multiple steepings, as unlike coffee, many teas can be reused for several infusions. Below follows the average results. 1st steep: the tea produced a smoky aroma as well as a smell similar to spices used in Thai food (some would also liken it to a slightly fishy smell). To encapsulate the oral experience, it had a bit of teriyaki, a nice smokiness, strong earthiness, a nice jalepeno after taste and a surprisingly smooth body. 2nd steep: the aroma remained pretty constant (smoky and thai spices) but the taste had much more jalepeno and pepper in this cup. Unlike the first cup, there was a little sweetness in this cup akin to jasmine. 3rd steep: the aromas remained strong and the flavors still had a smoky and spicy taste. The sweetness and other flavors were much less present but overall still good. Overall, I really liked this tea. While it's not a tea for the average tea drinker, I would recommend it for someone who likes strong, aromatic teas with nontraditional flavors (kinda like lapsang souchong) and/or a person who likes to try something different. If you're looking for a decent Pu-erh, give Golden Moon a try. note: tea was provided free of charge and the above review is objective feedback.